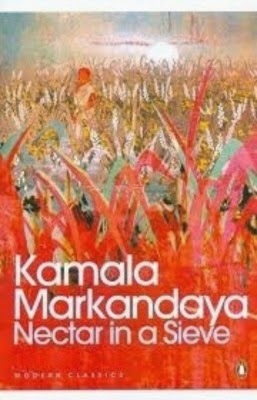 Nectar In A Sieve: A Novel is Kamala Markandaya’s first published novel and is set during the period of rapid development in urban india. The protagonist, Rukmani, talks about about her arranged marriage to Nathan in first person in this book. The story pans across from the time she was twelve, when she got married, until the death of her husband many years later. Although the book avoids particulars about the time period in which and the exact places where the story is set, clues in the context suggest that the story was set in the author’s contemporary India. The novel presents a multi-faceted account of India, exploring various themes during the aforementioned period. It discusses, through Rukmani’s story, the erosion of traditional methods of participating in the economy, the importance of financial security and political freedom, the prevailing tension between Hindus and Muslims, and the teachings of Mahatma Gandhi. All these themes are neatly crafted into the story of Rukmani and the hardships that she faces. A steady undercurrent of optimism flows through the entire narrative, portraying her indomitable spirit, her endurance to worsening situations, and her craving for a better tomorrow. Nectar In A Sieve: A Novel was published in 1954 and became a bestseller. In 1955, it was cited as an American Library Association Notable Book. Kamala Markandaya (1924 - May 16, 2004) was a pen-name used by Indian author and journalist Kamala Purnaiya Taylor. Nectar In A Sieve: A Novel became very popular in the west on account of its portrayal of rural india. The other books authored by Markandaya are Some Inner Fury, which depicts the clash between the East and the West and its repercussions, A Handful of Rice, The Nowhere Man, Two Virgins, and Pleasure City. Markandaya is known for writing extensively about the urban-rural divide. She made her mark not just by the subject matter that she spoke about through her books but also by virtue of her refined style of writing. All her novels reveal her profound obsession with the evolving social and political scene in India. Markandaya was born in Bangalore and graduated from Madras University. After India’s independence in 1947, she moved to Britain although she continued to consider herself an Indian expatriate. Apart from writing novels, Markandaya also authored many short stories that were published in Indian newspapers.